the golden days of American capitalism are over—or so the authors opine. That conclusion may seem surprising, as the U.S. economy appears to be flourishing. But the current GDP growth rate of roughly 3 percent, after deducting a 1 percent demographic increase, is rather modest, the authors maintain, compared with the historic performance of the postwar years, when the economy grew at an annual average of 5 percent. Moreover, unemployment appears low only because a significant portion of the population is no longer looking for work. Greenspan and Wooldridge reject the conventional wisdom on mature economies growing more slowly. They blame relatively slow growth in the U.S. on the increase in entitlement spending and the expansion of the welfare state—a classic free-market argument. They are right to reject the conventional wisdom. Slow growth is due to the expansion of government spending (including entitlements) and the regulatory burden. See “The Rahn Curve in Action” for details, including an equation that accurately explains the declining rate of growth since the end of World War II. mainstream pro-lifers vigorously resist this argument. At the same time they insist that “the unborn child is a human being, worthy of legal protection,” as Sarah St. Onge wrote in these pages recently, they loudly protest when so-called “fringe” pro-lifers state the obvious: of course women who willfully hire abortionists to kill their children should be prosecuted. … If the Supreme Court decides abortion is not protected by a constitutional guarantee of privacy, the issue will revert to the states. If it goes to the states, some, perhaps many, will ban abortion. If abortion is made a crime, then surely the woman who has one is a criminal. But, boy, do the doctrinaire suddenly turn squirrelly at the prospect of throwing women in jail. “They never connect the dots,” says Jill June, president of Planned Parenthood of Greater Iowa. The aim of Quindlen’s column is to scorn the idea of jail time as punishment for a woman who procures an illegal abortion. In fact, Quindlen’s “logic” reminds me of the classic definition of chutzpah: “that quality enshrined in a man who, having killed his mother and father, throws himself on the mercy of the court because he is an orphan.” The chutzpah, in this case, belongs to Quindlen (and others of her ilk) who believe that a woman should not face punishment for an abortion because she has just “lost” a baby. Quindlen (who predictably opposes capital punishment) asks “How much jail time?” in a cynical effort to shore up the anti-life front. It ain’t gonna work, lady. See also “Abortion Q & A“. In a new analysis of the latest numbers [by the Center for Immigration Studies], from 2014, 63 percent of non-citizens are using a welfare program, and it grows to 70 percent for those here 10 years or more, confirming another concern that once immigrants tap into welfare, they don’t get off it. See also “Immigration and Crime” and “Immigration and Intelligence“. Responding to what he cutely calls “economic piety”—the belief that GDP per capita defines a country’s well-being, and the role of society is to ensure the economic “pie” grows sufficiently to allow each individual to consume satisfactorily—Cass offers a competing hypothesis…. [A]s Cass argues, if well-being is measured by considerations in addition to economic ones, a GDP-based measurement of how our society is doing might not only be insufficient now, but also more costly over the long term. The definition of success in our public policy (and cultural) efforts should certainly include some economic measures, but not at the expense of the health of community and family life. People need to feel needed. The hollowness at the heart of American—Western?—society can’t be satiated with shinier toys and tastier brunches. An overemphasis on production could, of course, be as fatal as an overemphasis on consumption, and certainly the realm of the meritocrats gives enough cause to worry on this score. But as a matter of policy—as a means of not just sustaining our fellow citizen in times of want but of helping him feel needed and essential in his family and community life—Cass’s redefinition of “efficiency” to include not just its economic sense but some measure of social stability and human flourishing is welcome. Frankly, it’s past due as a tenet of mainstream conservatism. Cass suggests replacing the current Earned Income Tax Credit (along with some related safety net programs) with a direct wage subsidy, which would be paid to workers by the government to “top off” their current wage. In lieu of a minimum wage, the government would set a “target wage” of, say, $12 an hour. If an employee received $9 an hour from his employer, the government would step up to fill in that $3 an hour gap. That’s no solution at all, inasmuch as the cost of a subsidy must be borne by someone. The someone, ultimately, is the low-wage worker whose wage is low because he is less productive than he would be. Why is he less productive? Because the high-income person who is taxed for the subsidy has that much less money to invest in business capital that raises productivity. The real problem is that America — and the West, generally — has turned into a spiritual and cultural wasteland. See, for example, “A Century of Progress?“, “Prosperity Isn’t Everything“, and “James Burnham’s Misplaced Optimism“. Amendment I to the Constitution says that “Congress shall make no law … abridging the freedom of speech”. The Supreme Court accepted the case on [October 12]…. the court of Chief Justice John Roberts has shown a distinct preference for speech cases that concern conservative ideology, according to an empirical analysis conducted by researchers affiliated with Washington University in St. Louis and the University of Michigan. In the space of a few years, these sorts of severe legal prohibitions—usually known as “anti-reparative” and “anti-conversion” laws—have spread to many more jurisdictions, not only across the United States, but also in Canada, Britain, and Australia. Transgender ideology, it appears, brooks no opposition from any quarter…. Among the noteworthy patterns Littman found in the survey data: twenty-one percent of parents reported their child had one or more friends who become transgender-identified at around the same time; twenty percent reported an increase in their child’s social media use around the same time as experiencing gender dysphoria symptoms; and forty-five percent reported both. For more about this outrage see “The Transgender Fad and Its Consequences“. Among the claims made in favor of the Tax Cuts and Jobs Act of 2017 was that the resulting tax cuts would pay for themselves. Thus the Laffer curve returned briefly to prominence, after having been deployed to support the Reagan and Bush tax cuts of 1981 and 2001. The idea behind the Laffer curve is straightforward. Taxes inhibit economic activity, that is, the generation of output and income. Tax-rate reductions therefore encourage work, which yields higher incomes. Higher incomes mean that there is more saving from which to finance growth-producing capital investment. Lower tax rates also make investment more attractive by increasing the expected return on capital investments. Lower tax rates therefore stimulate economic output by encouraging work and investment (supply-side economics). Under the right conditions, lower tax rates may generate enough additional income to yield an increase in tax revenue. 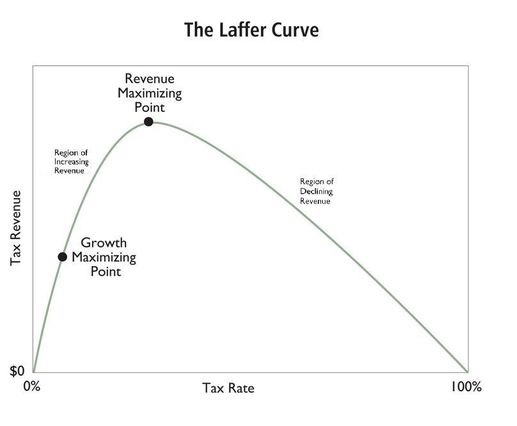 I believe that there are conditions under which the Laffer curve works as advertised. But so what? 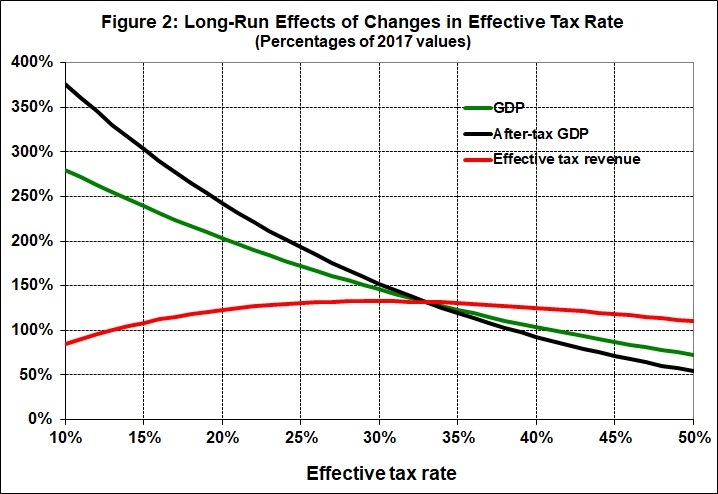 The Laffer curve focuses attention on the wrong economic variable: tax revenue. The economic variables that really matter — or that should matter — are the real rate of growth and the income available to Americans after taxes. More (real) economic growth means higher (real) income, across the board. More government spending means lower (real) income; the Keynesian multiplier is a cruel myth. A new Laffer curve is in order, one that focuses on the effects of taxation on economic growth, and thus on the aggregate output of products and services available to consumers. 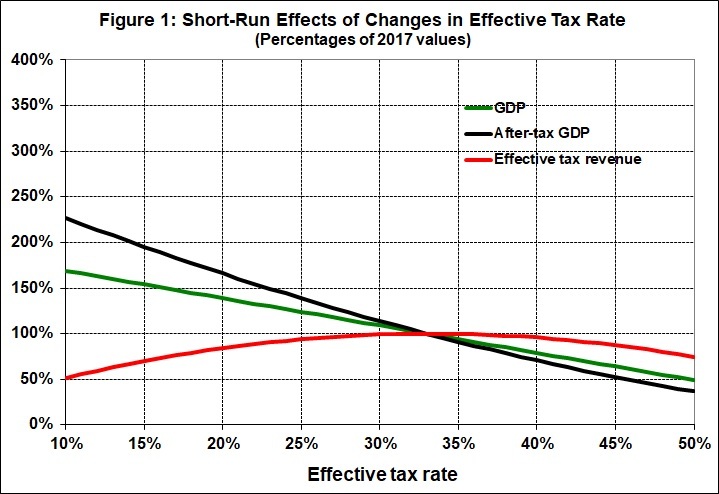 This is an unusually sophisticated depiction of the curve, in that it shows a growth-maximizing tax rate which is lower than the revenue-maximizing rate. It also shows that the growth-maximizing rate is greater than zero, for a good reason. With real taxes (i.e., government spending) at zero or close to it, the rule of law would break down and the economy would be a shambles. But government spending above that required to maintain the rule of law (i.e., adequate policing, administration of justice, and national defense) interferes with the efficient operation of markets, both directly (by pulling resources out of productive use) and indirectly (by burdensome regulation financed by taxes). Thus a tax rate higher than that required to sustain the rule of law1 leads to a reduction in the rate of (real) economic growth because of disincentives to work and invest. A reduction in the rate of growth pushes GDP below its potential level. Further, the effect is cumulative. A reduction in GDP means a reduction in investment, which means a reduction in future GDP, and on and on. I will quantify the Laffer curve in two steps. First, I will estimate the tax rate at which revenue is maximized, taking the simplistic view that changes in the tax rate do not change the rate of economic growth. I will draw on Christina D. Romer and David H. Romer’s “The Macroeconomic Effects of Tax Changes: Estimates Based on a New Measure of Fiscal Shocks” (American Economic Review, June 2010, pp. 763-801). The Romers assess the effects of tax cuts over a period of only 12 quarters (3 years). Some of the resulting growth in GDP during that period takes the form of greater spending on capital investments, the payoff from which usually takes more than 3 years to realize. So a tax cut of 1 percent of GDP yields more than a 3-percent rise in GDP over the longer run. But let’s keep it simple and use the relationship obtained by the Romers: a 1-percent tax cut (as a percentage of GDP) results in a 3-percent rise in GDP. It is a coincidence that tax revenue is maximized at the current (2017) effective tax rate of 33 percent. The coincidence occurs because, according to the Romers, every $1 change in tax revenue (or government spending that draws resources from the real economy) yields a $3 change in GDP, at the margin. If the marginal rate of return were lower than 3:1, the revenue-maximizing rate would be greater than 33 percent. If the marginal rate of return were higher than 3:1, the revenue-maximizing rate would be less than 33 percent. In any event, the focus on tax revenue is entirely misplaced. What really matters, given that the prosperity of Americans is (or should be) of paramount interest, is GDP and especially after-tax GDP. Both would rise markedly in response to marginal cuts in real taxes (i.e., government spending). Democrats don’t want to hear that, of course, because they want government to decide how Americans spend the money that they earn. The idea that a far richer America would need far less government — subsidies, nanny-state regulations, etc. — frightens them. It gets better (or worse, if you’re a big-government fan) when looking at the long-run effects of lower government spending on the rate of growth. I am speaking of the Rahn curve, which I estimate here. Holding other things the same, every percentage-point reduction in the real tax rate (government spending as a fraction of GDP) means an increase of 0.35 percentage point in the rate of real GDP growth. This is a long-run relationship because it takes time to convert some of the tax reduction to investment, and then to reap the additional output generated by the additional investment. It also takes time for workers to respond to the incentive of lower taxes by adding to their skills, working harder, and working in more productive jobs. Note that the same real tax revenue would be realized at an effective tax rate of 13 percent of GDP. At that rate, GDP would rise to 2.5 times its 2017 value (instead of 1.6 times as shown in Figure 1), and after-tax GDP would rise to 3.3 times its 2017 value (instead of 2.1 times as shown in Figure 1). At the current effective tax rate — 33 percent of GDP — the economy is limping along at about one-third of its potential growth. That is actually good news, inasmuch as the real growth rate dipped perilously close to 1 percent several times during the Obama administration, even after the official end of the Great Recession. But it will take many years of spending cuts (relative to GDP, at least) and deregulation to push growth back to where it was in the decades immediately after World War II. Five percent isn’t out of the question. 1. Total government spending, when transfer payments were negligible, amounted to between 5 and 10 percent of GDP between the Civil War and the Great Depression (Series F216-225, “Percent Distribution of National Income or Aggregate Payments, by Industry, in Current Prices: 1869-1968,” in Chapter F, National Income and Wealth, Historical Statistics of the United States, Colonial Times to 1970: Part 1). The cost of an adequate defense is a lot higher than it was in those relatively innocent times. Defense spending now accounts for about 3.5 percent of GDP. An increase to 5 percent wouldn’t render the U.S. invulnerable, but it would do a lot to deter potential adversaries. So at 10 percent of GDP, government spending on policing, the administration of justice, and defense — and nothing else — should be more than adequate to sustain the rule of law. See Part IV of this post. Given the long, downward trend in the real rate of GDP growth, it is statistical nonsense to pin the growth rate in any given year to a particular year of a particular president’s term. It is evident that GDP growth has been influenced mainly by the cumulative, anti-growth effects of government regulation. And GDP growth, in any given year, has been an almost-random variation on a downward theme. 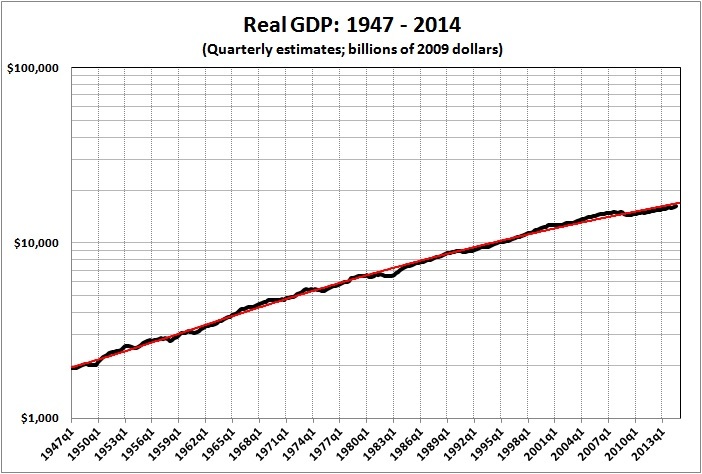 Derived from Bureau of Economic Analysis, “Current dollar and ‘real’ GDP,” as of April 28, 2017. The one-year lag (which is usual in such analyses) allows for the delayed effects (if any) of a president’s economic policies. The usual suspects are claiming, laughably, that the tepid growth rate in the first calendar quarter of 2017 is somehow Trump’s fault. Random, short-run fluctuations in GDP growth have almost nothing to do with the policies of a particular president (see the first graph). But there’s nothing random about the steady growth of government spending, the steadier growth of the regulatory burden, and the combined investment-killing and inflationary effects of both (see the second graph). The long-run trend in GDP growth reflects the cumulative effects of policies carried out by the “deep state” — the apparatus that churns on with little change in direction from president to president: the special interests represented in the many committees of Congress, the Social Security Administration (which also encompasses Medicare and Medicaid), and the entire alphabet soup of federal regulatory agencies. Most of those entities became committed, long ago, to the growth of government spending and regulation. It will take more than a slogan to drain the swamp. John H. Arnold characterizes war as “long periods of boredom punctuated by short moments of excitement.” I would say that the economy of the United States has been on a long slide into stagnation punctuated by brief periods of misplaced optimism. See also John Hinderaker’s Powerline post, “Daniel Pipes: The Obama Doctrine Serves Up One Disaster After Another” (April 6, 2015), and a piece by Eileen F. Toplansky,”Obama’s Three Premises” (American Thinker, April 20, 2015). The answer: a rational, scientific case rooted in established theory and data would convince me that manmade climate change is a problem. That it is real is not in doubt, for every creature that breathes out emits CO2 and thus affects the climate. The true scientific question, then, is not the fatuous question whether “Man-Made Climate Change Is Real” but how much global warming our sins of emission may cause, and whether that warming might be more a bad thing than a good thing. [I]f Mr Bailey does me the courtesy of reading the above, he will realize that temperatures are not rising by much, glacial ice-melt (if occurring) is on too small a scale to raise sea level by much, global sea ice extent shows little change in two generations, ditto northern-hemisphere snow cover, there has been little increase in rainfall and (according to the IPCC) little evidence for “stronger rainstorms”, and the ocean warming is so small that it falls within the considerable measurement error. The evidence he adduces is questionable at best on every count. The Temple of Thermageddon will have to do better than that if it wants to convince us in the teeth of the evidence…. …[N]o rational scientific or economic case can be made for taking any action whatsoever today in a probably futile and certainly cost-ineffective attempt to make global warming that is not happening as predicted today go away the day after tomorrow. The correct policy to address what is likely to prove a non-problem – and what, even if it were every bit as much of a problem as the tax-gobblers would wish, could not by even their most creative quantitative easing be cost-effectively solved by any attempt at mitigation – is to have the courage to do nothing now and adapt later if necessary. In the last few years, there appears to have been a decision to blame racial differences in intelligence on differences in income level, although, of course, that’s not very plausible. That’s what people said way back in 1965, but then the federal Coleman Report of 1966 showed that affluent black students weren’t setting the world on fire academically on average, and vast amounts of data have accumulated validating the Coleman Report ever since. But a half century later we’re back to asserting the same untested theories as in 1965…. Along the way, Sailer links to Dr. James Thompson’s post about the article in question. There’s a followup post by Thompson, and this one is good, too. See also this post by Sailer. There is a new paper out in Nature Neuroscience, mainly by Kimberly Noble, on socioeconomic variables and and brain structure: Family income, parental education and brain structure in children and adolescents. They found that cortex area went up with income, although more slowly at high incomes. Judging from their comments to the press, the authors think that being poor shrinks your brain. Of course, since intelligence is highly heritable, and since people in higher social classes, or with high income, have higher average IQs (although not nearly as high as I would like), you would expect their kids to be, on average, smarter than kids from low-income groups (and have larger brains, since brain size is correlated with IQ) for genetic reasons. But I guess the authors of this paper have never heard of any of that – which raises the question, did they scan the brains of the authors? Because that would have been interesting. You can actually do microscopic MRI. Even better, in talking to Nature, another researcher, Martha Farah, mentions unpublished work that shows that the brain-size correlation with SES is already there (in African-American kids) by age one month! Quick thinkers are born not made, claim scientists. They have discovered a link between our genes and the ability to remain mentally on the ball in later life. It is the first time a genetic link has been shown to explain why some people have quick thinking skills. Dr. Ray links to the underlying studies, here. 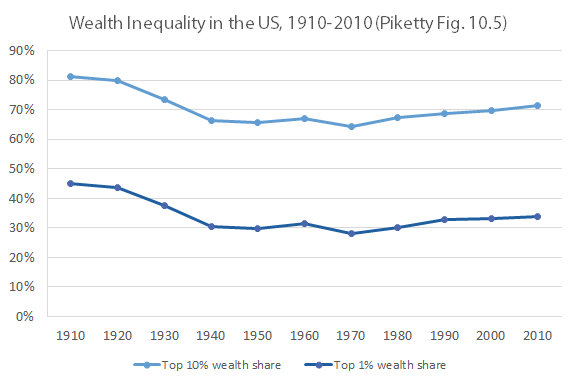 Piketty’s chart on US wealth inequality displayed a trend that none of its original sources showed. Worst of all, he didn’t tell his readers that he had done any of this, much less explained his reasoning. But now Magness has deconstructed the chart and shown, step by step, how Piketty tortured his sources into giving him the result he wanted to see…. If your methods can produce opposite results using the same sources, depending entirely on your subjective judgment, you’re not doing science — you’re doing a Choose Your Own Adventure story where you start from the conclusion and work backwards. Now that you’ve seen how it’s done, you too can “piketty” your data and massage your narrative into selling 1.5 million books — that almost no one will actually read, but will be widely cited as justification for higher taxes nonetheless. In 2006, by a margin of more than two to one, 69-28, those surveyed by Gallup said that the federal government should guarantee health care coverage for all citizens of the United States. By late 2014, however, Gallup found that this percentage had fallen 24 points to 45 percent, while the percentage of respondents who said health care is not a federal responsibility nearly doubled to 52 percent. Edsall’s main worry seems to be how such a mood shift will help Republicans. Evidently, he doesn’t care about taxpayers, people who earn their income, or economic growth, which is inhibited by redistribution from “rich” to “poor.” But what else is new? Edsall is just another representative of the elite punditariat — a member of the “top” part of the left’s “top and bottom” coalition. Edsall and his ilk should be worried. See, for example, “The Obamacare Effect: Greater Distrust of Government” (the title tells the tale) and “‘Blue Wall’ Hype” which debunks the idea that Democrats have a lock on the presidency. Obamacare, not unsurprisingly to me, has led to the rationing of health care, according to Bob Unruh’s “Obamacare Blocks Patients Paying for Treatment” (WND, March 6, 2014). And Aleyne Singer delivers “More Proof Obamacare Is Increasing Coverage but Not Access to Health Care” (The Daily Signal, December 9, 2014). Ben Bernanke asks “Why Are Interest Rates So Low?” (Ben Bernanke’s Blog, March 30, 2015). His answer? In so many words, business is bad, which means that the demand for capital financing is relatively weak. But in a followup post, “Why Are Interest Rates So Low, Part 2: Secular Stagnation” (Ben Bernanke’s Blog, March 31, 2015), Bernanke argues that the problem isn’t secular stagnation. I agree that interest rates are low because the economy remains weak, despite some recovery from the nadir of the Great Recession. But, unlike Bernanke, I don’t expect the economy to make a full recovery — and I’m talking about real growth, not phony unemployment-rate recovery. Why Not? See “Obamanomics in Action” and “The Rahn Curve Revisited.” The economy will never grow to its potential as long as the dead hand of government continues to press down on it. These burdens take the form of taxes, regulations, and uncertainties loaded onto them by governments at every level. Each year, for example, federal departments and regulatory agencies put into effect several thousand new regulations. Only rarely do these agencies remove any existing rules from the Code of Federal Regulations. Thus, the total number in effect continues to climb relentlessly. The tangle of federal red tape becomes ever more difficult for investors, entrepreneurs, and business managers to cut through. Business people have to bear not only a constantly changing, ever more complex array of taxes, fees, and fines, but also a larger and larger amount of regulatory compliance costs, now estimated at more than $1.8 trillion annually. Governments at the state and local levels contribute their full share of such burdens as well. The combined effects of regulation, taxation, and regime uncertainty are captured in the Rahn curve, which depicts the long-term relationship between government spending (as a fraction of GDP) and the rate of economic growth. I say that because government spending and regulatory activity have grown apace since the end of World War II. That might be taken as certainty, of a perverse kind, but beleaguered entrepreneurs can never be certain of the specific obstacles that will be thrown in the path of innovation and investment. The graphs are derived from “Current dollar and ‘real’ GDP,” at the website of the Bureau of Economic Analysis of the U.S. Department of Commerce. The “Obama recovery” is an anemic thing. Is it any wonder, given Obama’s incessant war on success? It will take more than a “push back” to restore the economy — and liberty — to health. Obama and his ilk must be driven from office, and kept out of office for good. the annual (year-over-year) change in real GDP is negative, in at least one quarter. Unlike the NBER, I do not locate a recession in 2001. Real GDP, measured quarterly, dropped in the first and third quarters of 2001, but each decline lasted only a quarter. My method of identifying a recession is more objective and consistent than the NBER’s method, which one economist describes as “The NBER will know it when it sees it.” Moreover, unlike the NBER, I would not presume to pinpoint the first and last months of a recession, given the volatility of GDP estimates. Real gross domestic product — the value of the production of goods and services in the United States, adjusted for price changes — increased at an annual rate of 5.0 percent in the third quarter of 2014, according to the “third” estimate released by the Bureau of Economic Analysis. In the second quarter, real GDP increased 4.6 percent. For more, see “The Rahn Curve Revisited” and the list of posts at the bottom. Piketty gives a fine example of how to do it [economic history]. He does not get entangled as so many economists do in the sole empirical tool they are taught, namely, regression analysis on someone else’s “data”…. Therefore he does not commit one of the two sins of modern economics, the use of meaningless “tests” of statistical significance…. Piketty constructs or uses statistics of aggregate capital and of inequality and then plots them out for inspection, which is what physicists, for example, also do in dealing with their experiments and observations. Nor does he commit the other sin, which is to waste scientific time on existence theorems. Physicists, again, don’t. If we economists are going to persist in physics envy let’s at least learn what physicists actually do. Piketty stays close to the facts, and does not, say, wander into the pointless worlds of non-cooperative game theory, long demolished by experimental economics. He also does not have recourse to non-computable general equilibrium, which never was of use for quantitative economic science, being a branch of philosophy, and a futile one at that. On both points, bravissimo. His book furthermore is clearly and unpretentiously, if dourly, written…. On the next to last page of his book Piketty writes, “It is possible, and even indispensable, to have an approach that is at once economic and political, social and cultural, and concerned with wages and wealth.” One can only agree. But he has not achieved it. His gestures to cultural matters consist chiefly of a few naively used references to novels he has read superficially—for which on the left he has been embarrassingly praised. His social theme is a narrow ethic of envy. His politics assumes that governments can do anything they propose to do. And his economics is flawed from start to finish. It is a brave book. But it is mistaken. [T]he left in its worrying routinely forgets this most important secular event since the invention of agriculture—the Great Enrichment of the last two centuries—and goes on worrying and worrying, like the little dog worrying about his bone in the Traveler’s insurance company advertisement on TV, in a new version every half generation or so. Here is a partial list of the worrying pessimisms, which each has had its day of fashion since the time, as the historian of economic thought Anthony Waterman put it, “Malthus’ first  Essay made land scarcity central. And so began a century-long mutation of ‘political economy,’ the optimistic science of wealth, to ‘economics,’ the pessimistic science of scarcity.” Malthus worried that workers would proliferate and Ricardo worried that the owners of land would engorge the national product. Marx worried, or celebrated, depending on how one views historical materialism, that owners of capital would at least make a brave attempt to engorge it…. Mill worried, or celebrated, depending on how one views the sick hurry of modern life, that the stationary state was around the corner. Then the economists, many on the left but some on the right, in quick succession 1880 to the present—at the same time that trade-tested betterment was driving real wages up and up and up—commenced worrying about, to name a few of the grounds for pessimisms they discerned concerning ”capitalism”: greed, alienation, racial impurity, workers’ lack of bargaining strength, women working, workers’ bad taste in consumption, immigration of lesser breeds, monopoly, unemployment, business cycles, increasing returns, externalities, under-consumption, monopolistic competition, separation of ownership from control, lack of planning, post-War stagnation, investment spillovers, unbalanced growth, dual labor markets, capital insufficiency … , peasant irrationality, capital-market imperfections, public choice, missing markets, informational asymmetry, third-world exploitation, advertising, regulatory capture, free riding, low-level traps, middle-level traps, path dependency, lack of competitiveness, consumerism, consumption externalities, irrationality, hyperbolic discounting, too big to fail, environmental degradation, underpaying of care, overpayment of CEOs, slower growth, and more. One can line up the later items in the list, and some of the earlier ones revived à la Piketty or Krugman…. I will not name here the men … , but can reveal their formula: first, discover or rediscover a necessary condition for perfect competition or a perfect world (in Piketty’s case, for example, a more perfect equality of income). Then assert without evidence (here Piketty does a great deal better than the usual practice) but with suitable mathematical ornamentation (thus Jean Tirole, Nobel 2014) that the condition might be imperfectly realized or the world might not develop in a perfect way. Then conclude with a flourish (here however Piketty falls in with the usual low scientific standard) that “capitalism” is doomed unless experts intervene with a sweet use of the monopoly of violence in government to implement anti-trust against malefactors of great wealth or subsidies to diminishing-returns industries or foreign aid to perfectly honest governments or money for obviously infant industries or the nudging of sadly childlike consumers or, Piketty says, a tax on inequality-causing capital worldwide. A feature of this odd history of fault-finding and the proposed statist corrections, is that seldom does the economic thinker feel it necessary to offer evidence that his … proposed state intervention will work as it is supposed to, and almost never does he feel it necessary to offer evidence that the imperfectly attained necessary condition for perfection before intervention is large enough to have reduced much the performance of the economy in aggregate. Piketty’s (and Aristotle’s) theory is that the yield on capital usually exceeds the growth rate of the economy, and so the share of capital’s returns in national income will steadily increase, simply because interest income—what the presumably rich capitalists get and supposedly manage to cling to and supposedly reinvest—is growing faster than the income the whole society is getting. Aristotle and his followers, such as Aquinas and Marx and Piketty, were much concerned with such “unlimited” gain. The argument is, you see, very old, and very simple. Piketty ornaments it a bit with some portentous accounting about capital-output ratios and the like, producing his central inequality about inequality: so long as r > g, where r is the return on capital and g is the growth rate of the economy, we are doomed to ever increasing rewards to rich capitalists while the rest of us poor suckers fall relatively behind. The merely verbal argument I just gave, however, is conclusive, so long as its factual assumptions are true: namely, only rich people have capital; human capital doesn’t exist; the rich reinvest their return; they never lose it to sloth or someone else’s creative destruction; inheritance is the main mechanism, not a creativity that raises g for the rest of us just when it results in an r shared by us all; and we care ethically only about the Gini coefficient, not the condition of the working class. Notice one aspect of that last: in Piketty’s tale the rest of us fall only relatively behind the ravenous capitalists. The focus on relative wealth or income or consumption is one serious problem in the book. Piketty’s vision of a “Ricardian Apocalypse,” as he calls it, leaves room for the rest of us to do very well indeed, most non-apocalyptically, as in fact since 1800 we have. What is worrying Piketty is that the rich might possibly get richer, even though the poor get richer, too. His worry, in other words, is purely about difference, about the Gini coefficient, about a vague feeling of envy raised to a theoretical and ethical proposition. Another serious problem is that r will almost always exceed g, as anyone can tell you who knows about the rough level of interest rates on invested capital and about the rate at which most economies have grown (excepting only China recently, where contrary to Piketty’s prediction, inequality has increased). If his simple logic is true, then the Ricardian Apocalypse looms, always. Let us therefore bring in the sweet and blameless and omni-competent government—or, even less plausibly, a world government, or the Gallactic Empire—to implement “a progressive global tax on capital” (p. 27) to tax the rich. It is our only hope…. In other words, Piketty’s fears were not confirmed anywhere 1910 to 1980, nor anywhere in the long run at any time before 1800, nor anywhere in Continental Europe and Japan since World War II, and only recently, a little, in the United States, the United Kingdom, and Canada (Canada, by the way, is never brought into his tests). That is a very great puzzle if money tends to reproduce itself, always, evermore, as a general law governed by the Ricardo-plus-Marx inequality at the rates of r and g actually observed in world history. Yet inequality in fact goes up and down in great waves, for which we have evidence from many centuries ago down to the present, which also doesn’t figure in such a tale (Piketty barely mentions the work of the economic historians Peter Lindert and Jeffrey Williamson documenting the inconvenient fact). According to his logic, once a Pikettywave starts—as it would at any time you care to mention if an economy satisfied the almostalways-satisfied condition of the interest rate exceeding the growth rate of income—it would never stop. Such an inexorable logic means we should have been overwhelmed by an inequality-tsunami in 1800 CE or in 1000 CE or for that matter in 2000 BCE. At one point Piketty says just that: “r > g will again become the norm in the twenty-first century, as it had been throughout history until the eve of World War I (… one wonders what he does with historically low interest rates right now, or the negative real interest rates in the inflation of the 1970s and 1980s). Why then did the share of the rich not rise anciently to 100 percent? With a bigger pie, someone has to get more. In the event what rose were wages on raw labor and especially a great accumulation of human capital, but capital owned by the laborers, not by the truly rich. The return to physical capital was higher than a riskless return on British or American government bonds, in order to compensate for the risk in holding capital (such as being made obsolete by betterment—think of your computer, obsolete in four years). But the return on physical capital, and on human capital, was anyway held down to its level of very roughly 5 to 10 percent by competition among the proliferating capitalists. Imagine our immiserization if the income of workers, because they did not accumulate human capital, and their societies had not adopted the accumulation of ingenuities since 1800, had experienced the history of stagnation since 1800 that the per-unit return to capital has. It is not hard to imagine, because such miserable income of workers exists even now in places like Somalia and North Korea. Instead, since 1800 in the average rich country the income of the workers per person increased by a factor of about 30 (2,900 percent, if you please) and in even in the world as a whole, including the still poor countries, by a factor of 10 (900 percent), while the rate of return to physical capital stagnated. Piketty does not acknowledge that each wave of inventors, of entrepreneurs, and even of routine capitalists find their rewards taken from them by entry, which is an economic concept he does not appear to grasp. Look at the history of fortunes in department stores. The income from department stores in the late nineteenth century, in Le Bon Marché, Marshall Fields, and Selfridge’s, was entrepreneurial. The model was then copied all over the rich world, and was the basis for little fortunes in Cedar Rapids, Iowa and Benton Harbor, Michigan. Then in the late twentieth century the model was challenged by a wave of discounters, and they then in turn by the internet. The original accumulation slowly or quickly dissipates. In other words, the profit going to the profiteers is more or less quickly undermined by outward-shifting supply, if governmental monopolies and protectionisms of the sort Matt Ridley noted in recent British history do not intervene. The economist William Nordhaus has calculated that the inventors and entrepreneurs nowadays earn in profit only 2 percent of the social value of their inventions. If you are Sam Walton the 2 percent gives you personally a great deal of money from introducing bar codes into stocking of supermarket shelves. But 98 percent at the cost of 2 percent is nonetheless a pretty good deal for the rest of us. The gain from macadamized roads or vulcanized rubber, then modern universities, structural concrete, and the airplane, has enriched even the poorest among us. Piketty, who does not believe in supply responses [as discussed below], focuses instead on the great evil of very rich people having seven Rolex watches by mere inheritance. Lillian Bettancourt, heiress to the L’Oréal fortune (p. 440), the third richest woman in the world, who “has never worked a day in her life, saw her fortune grow exactly as fast as that of [the admittedly bettering] Bill Gates.” Ugh, Piketty says, which is his ethical philosophy in full. [T]he effect of inherited wealth on children is commonly to remove their ambition, as one can witness daily on Rodeo Drive. Laziness—or for that matter regression to the mean of ability—is a powerful equalizer. “There always comes a time,” Piketty writes against his own argument, “when a prodigal child squanders the family fortune” (p. 451), which was the point of the centuries-long struggle in English law for and against entailed estates. Because Piketty is obsessed with inheritance, moreover, he wants to downplay entrepreneurial profit, the trade-tested betterment that has made the poor rich. It is again Aristotle’s claim that money is sterile and interest is therefore unnatural. Aristotle was on this matter mistaken. It is commonly the case, contrary to Piketty, and setting aside the cheapening of our goods produced by the investments of their wealth by the rich, that the people with more money got their more by being more ingeniously productive, for the benefit of us all—getting that Ph.D., for example, or being excellent makers of automobiles or excellent writers of horror novels or excellent throwers of touchdown passes or excellent providers of cell phones, such as Carlos Slim of Mexico, the richest man in the world (with a little boost, it may be, from corrupting the Mexican parliament). That Frank Sinatra became richer than most of his fans was not an ethical scandal. The “Wilt Chamberlain” example devised by the philosopher Robert Nozick (Piketty mentions John Rawls, but not Nozick, Rawls’ nemesis) says that if we pay voluntarily to get the benefit of clever CEOs or gifted athletes there is no further ethical issue. The unusually high rewards to the Frank Sinatras and Jamie Dimons and Wilt Chamberlains come from the much wider markets of the age of globalization and mechanical reproduction, not from theft. Wage inequality in the rich countries experiencing an enlarging gap of rich vs. poor, few though the countries are (Piketty’s finding, remember: Canada, U.S.A., U.K.)), is mainly, he reports, caused by “the emergence of extremely high remunerations at the summit of the wage hierarchy, particularly among top managers of large firms.” The emergence, note, has nothing to do with r > g.
Piketty’s definition of wealth does not include human capital, owned by the workers, which has grown in rich countries to be the main source of income, when it is combined with the immense accumulation since 1800 of capital in knowledge and social habits, owned by everyone with access to them. Therefore his laboriously assembled charts of the (merely physical and private) capital/output ratio are erroneous. They have excluded one of the main forms of capital in the modern world. More to the point, by insisting on defining capital as something owned nearly always by rich people, Piketty mistakes the source of income, which is chiefly embodied human ingenuity, not accumulated machines or appropriated land. The fundamental technical problem in the book, however, is that Piketty the economist does not understand supply responses…. Startling evidence of Piketty’s miseducation occurs as early as page 6. He begins by seeming to concede to his neoclassical opponents…. “To be sure, there exists in principle a quite simple economic mechanism that should restore equilibrium to the process [in this case the process of rising prices of oil or urban land leading to a Ricardian Apocalypse]: the mechanism of supply and demand. If the supply of any good is insufficient, and its price is too high, then demand for that good should decrease, which would lead to a decline in its price.” [This] clearly mix[es] up movement along a demand curve with movement of the entire curve, a first-term error at university. The correct analysis (we tell our first-year, first-term students at about week four) is that if the price is “too high” it is not the whole demand curve that “restores equilibrium” … , but an eventually outward-moving supply curve. The supply curve moves out because entry is induced by the smell of super-normal profits, in the medium and long run (which is the Marshallian definition of the terms). New oil deposits are discovered, new refineries are built, new suburbs are settled, new high-rises saving urban land are constructed, as has in fact happened massively since, say, 1973, unless government has restricted oil exploitation (usually on environmental grounds) or the building of high-rises (usually on corrupt grounds). Piketty goes on—remember: it does not occur to him that high prices cause after a while the supply curve to move out; he thinks the high price will cause the demand curve to move in, leading to “a decline in price” (of the scarce item, oil’s or urban land)—“such adjustments might be unpleasant or complicated.” To show his contempt for the ordinary working of the price system he imagines comically that “people should . . . take to traveling about by bicycle.” The substitutions along a given demand curve, or one mysteriously moving in, without any supply response “might also take decades, during which landlords and oil well owners might well accumulate claims on the rest of the population” (now he has the demand curve moving out, for some reason faster than the supply curve moves out) “so extensive that they could they could easily [on grounds not argued] come to own everything that can be owned, including” in one more use of the comical alternative, “bicycles, once and for all.” Having butchered the elementary analysis of entry and of substitute supplies, which after all is the economic history of the world, he speaks of “the emir of Qatar” as a future owner of those bicycles, once and for all. The phrase must have been written before the recent and gigantic expansion of oil and gas exploitation in Canada and the United States…. Piketty, it would seem, has not read with understanding the theory of supply and demand that he disparages, such as Smith (one sneering remark on p. 9), Say (ditto, mentioned in a footnote with Smith as optimistic), Bastiat (no mention), Walras (no mention), Menger (no mention), Marshall (no mention), Mises (no mention), Hayek (one footnote citation on another matter), Friedman (pp. 548-549, but only on monetarism, not the price system). He is in short not qualified to sneer at self-regulated markets (for example on p. 572), because he has no idea how they work. It would be like someone attacking the theory of evolution (which is identical to the theory the economists use of entry and exit in self-regulating markets—the supply response, an early version of which inspired Darwin) without understanding natural selection or the the Galton-Watson process or modern genetics. Beyond technical matters in economics, the fundamental ethical problem in the book is that Piketty has not reflected on why inequality by itself would be bad…. The motive of the true Liberal … should not be equality but [says Joshua Monk, a character in Anthony Trollope’s novel, Phineas] “the wish of every honest [that is, honorable] man . . . to assist in lifting up those below him.” Such an ethical goal was to be achieved, says Monk the libertarian liberal (as Richard Cobden and John Bright and John Stuart Mill were, and Bastiat in France at the time, and in our times Hayek and Friedman, or for that matter M’Cluskie), not by direct programs of redistribution, nor by regulation, nor by trade unions, but by free trade and tax-supported compulsory education and property rights for women—and in the event by the Great Enrichment, which finally in the late nineteenth century started sending real wages sharply up, Europe-wide, and then world-wide. Nor in the United States are the poor getting poorer. Horwitz observes that “looking at various data on consumption, from Census Bureau surveys of what the poor have in their homes to the labor time required to purchase a variety of consumer goods, makes clear that poor Americans are living better now than ever before. In fact, poor Americans today live better, by these measures, than did their middle class counterparts in the 1970s.” In the summer of 1976 an associate professor of economics at the University of Chicago had no air conditioning in his apartment. Nowadays many quite poor Chicagoans have it. The terrible heat wave in Chicago of July 1995 killed over 700 people, mainly low-income. Yet earlier heat waves in 1936 and 1948, before air-conditioning was at all common, had probably killed many more. To be sure, it’s irritating that a super rich woman buys a $40,000 watch. The purchase is ethically objectionable. She really should be ashamed. She should be giving her income in excess of an ample level of comfort—two cars, say, not twenty, two houses, not seven, one yacht, not five—to effective charities…. But that many rich people act in a disgraceful fashion does not automatically imply that the government should intervene to stop it. People act disgracefully in all sorts of ways. If our rulers were assigned the task in a fallen world of keeping us all wholly ethical, the government would bring all our lives under its fatherly tutelage, a nightmare achieved approximately before 1989 in East Germany and now in North Korea. And that is the key point, to my mind. Perfection always eludes the human race, even where its members have managed to rise from the primordial scramble for sustenance and above Hobbes’s “warre, as is of every man, against every man.” Economic progress without economic inequality is impossible, and efforts to reduce inequality by punishing economic success must inevitably hinder progress, which is built on the striving of entrepreneurs. Further, the methods used to punish economic success are anti-libertarian — whether they are the police-state methods of the Soviet Union or the “soft despotism” of the American regulatory-welfare state. Supposing our common purpose on the left and on the right, then, is to help the poor, … the advocacy by the learned cadres of the left for equalizing restrictions and redistributions and regulations can be viewed at best as thoughtless. Perhaps, considering what economic historians now know about the Great Enrichment, but which the left clerisy, and many of the right, stoutly refuse to learn, it can even be considered unethical. The left clerisy such as Tony Judt or Paul Krugman or Thomas Piketty, who are quite sure that they themselves are taking the ethical high road against the wicked selfishness of Tories or Republicans or La Union pour un Mouvement Populaire, might on such evidence be considered dubiously ethical. They are obsessed with first-[order] changes that cannot much help the poor, and often can be shown to damage them, and are obsessed with angry envy at the consumption of the uncharitable rich, of whom they personally are often examples (what will you do with your royalties, Professor Piketty? ), and the ending of which would do very little to improve the position of the poor. They are very willing to stifle through taxing the rich the trade-tested betterments which in the long run have gigantically helped the poor, who were the ancestors of most of the rest of us. I added the emphasis to underscore what seems to me to be the left’s greatest ethical offense in the matter of inequality, as it is in the matter of race relations: hypocrisy. Hypocritical leftists like Judt, Krugman, and Pikkety (to name only a few of their ilk) aren’t merely wrong in their views about how to help the (relatively) poor, they make money (and a lot of it) by espousing their erroneous views. They obviously see nothing wrong with making a lot of money. So why is it all right for them to make a lot of money — more than 99.9 percent of the world’s population, say — but not all right for other persons to make even more money? The dividing line between deservingness and greed seems always to lie somewhere above their munificent earnings. Most Piketty commentary … focuses on the theory, r>g, and so on. After all, that’s easy and you don’t have to read hundreds of pages. Thomas Piketty’s Capital in the 21st Century has been widely debated on theoretical grounds, yet continues to attract acclaim for its historically-infused data analysis. In this study we conduct a closer scrutiny of Piketty’s empirics than has appeared thus far, focusing upon his treatment of the United States. We find evidence of pervasive errors of historical fact, opaque methodological choices, and the cherry-picking of sources to construct favorable patterns from ambiguous data. Additional evidence suggests that Piketty used a highly distortive data assumption from the Soviet Union to accentuate one of his main historical claims about global “capitalism” in the 20th century. Taken together, these problems suggest that Piketty’s highly praised and historically-driven empirical work may actually be the book’s greatest weakness. I’ve quickly read Magness and Murphy’s paper. It seems to live up to the abstract. Piketty (and friends) may challenge Magness and Murphy, but Piketty bears the burden of showing that he hasn’t stacked the empirical deck in favor of his redistributionist message. Not that the empirical flaws should matter, given the theoretical flaws exposed by McCloskey and others, but Piketty’s trove of spurious statistics should be discredited before it becomes a standard reference. The remedy for economic collapse (in the Marxian-Pikettian view) is socialism (perhaps smuggled in as “democratic” redistributionism). It is, of course, the kind of imaginary, painless socialism favored by affluent professors and pundits — favored as long as it doesn’t affect their own affluence. It bears no resemblance to the actual kind of socialism experienced by the billions who have been oppressed by it and the tens of millions who have been killed for its sake. [I]nequality is bad [because] it is bad for growth, and if the reason it is bad for growth is that it leads to insufficient consumption and lack of demand…. That bit of hogwash serves the redistributionist agenda. As Cochrane puts it, “redistributive taxation is a perennial answer in search of a question.” Indeed. Inequality – growth is supposed to be about long run trends, not boom and slow recovery. Professor of Public Policy at U.S. Berkeley Robert Reich argues that increased inequality has reduced overall aggregate demand. He observes that high-income households have a lower marginal propensity to consume (MPC) out of income than other households. All economic output is of two distinct types: consumption and investment (i.e., the replacement of or increase in the stock of capital that is used to produce goods for consumption). The output of consumption goods must decline, ceteris paribus, if the stock of capital declines. The stock of capital is sustained (and increased) by forgoing consumption. The stock of capital is therefore sustained (and increased) by saving. Saving rises with income because persons in high-income brackets usually consume a smaller fraction of their incomes than do persons in middle- and low-income brackets. The redistribution of income from high-income earners to middle- and low-income earners therefore leads to a reduction in saving. A reduction in saving means less investment and, thus, a reduction in the effective stock of capital, as it wears out. With less capital, workers become less productive. In sum, efforts to make incomes more equal through redistribution have the opposite effect of the one claimed for it by ignorant bloviators like Robert Reich. So much for the claim that a higher rate of consumption is a good policy for the long run. What about in the short run; that is, what about Keynesian “stimulus” to “prime the pump”? I won’t repeat what I say in “The Keynesian Multiplier: Phony Math.” Go there, and see for yourself. Derived from the “Current dollar and real GDP series” issued by BEA. See this post for my definition of a recession. The economy is in recession, as will become evident when the BEA reports on GDP for the second quarter of 2014. In the three years to October 2008, the quantity of money soared from $10,032 billion to $14,186 billion, with a compound annual growth rate of just over 12 per cent. The money growth rate in this period was the highest since the early 1970s. Indeed, 1972 and 1973 had many similarities to 2006 and 2007, with bubbling asset markets, buoyant consumer spending and incipient inflationary pressures. On the other hand, in the three years from October 2008 the quantity of money was virtually unchanged. (It stood at $14,340 billion in October 2011.) In other words, in the three years of the Great Recession the quantity of money did not increase at all. The reason for these (and other) low rates is that borrowers have become less keen about borrowing; that is, they lack confidence about future prospects for income (in the case of households) and returns on investment (in the case of businesses). Why should that be? 1908-1929 — annual growth of 2.2 percent — a dispirited economy, shackled by the fruits of “progressivism” (e.g., trust-busting, regulation, the income tax, the Fed) and the government interventions that provoked and prolonged the Great Depression. 1947-1969 — annual growth of 3.9 percent — a rejuvenated economy, buoyed by the end of the New Deal, the forced saving that occurred during World War II, and (possibly) the fruits of advances in technology and business operations that were made but not exploited during the Depression (all proof that the rate of growth didn’t decline in the preceding era simply because the economy had “aged”). 1970-2010 — annual growth of 2.8 percent – sagging under the cumulative weight of “progressivism,” New Deal legislation, LBJ’s “Great Society” (with its legacy of the ever-expanding and oppressive welfare/transfer-payment schemes: Medicare, Medicaid, a more generous package of Social Security benefits), and an ever-growing mountain of regulatory restrictions. Derived from Bureau of Economic Analysis, Table 1.1.5. Gross Domestic Product (available here). The numerator is gross private domestic investment (GPDI, line 7) less the residential portion (line 12). The denominator is GDP (line 1) less government consumption expenditures and gross investment (line 21). In sum, the present focus on — and debate about — conventional macroeconomic “fixes” (fiscal vs. monetary policy) is entirely misguided. Today’s economists and policy-makers should consult Hayek, not Keynes or Friedman or their intellectual descendants. If economists and policy-makers would would read and heed Hayek — the Hayek of 1944 onward, in particular — they would understand that our present and future economic morass is entirely political in origin: Failed government policies have led to more failed government policies, which have shackled both the economy and the people.